The quality of the bag is really great - very sturdy... perfect for a green-themed party. I love that this product helps promote the overall message of my event (Green-themed Bar Mitzvah). It's also wonderful to have a useful favor for adults at our event. I am happy with the quality for the price. Q:Are they made in America? A:This item is made in China. Q:why is it called a set?! how many bags does one set include?! A:Each set includes 6 Eco Friendly Tote Bag Favors. Give Mother Earth a hug each time you give these eco friendly tote bag favors. 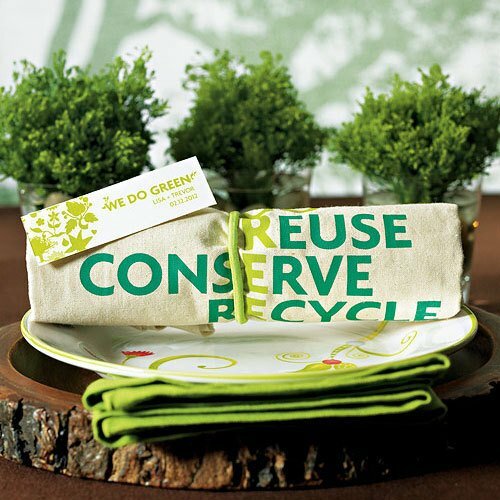 Perfect as welcome bags for out of town guests, corporate party giveaways and green-themed wedding favors. Each tote is made of all-natural cotton and printed with a "go green" eco- conscious message: "Reuse, conserve, recycle, sustain." Each bag measures 14.5"L x 16"W.